Dustin Wlodkowski is an anchor and reporter at NEWS CENTER Maine in Portland, Maine specializing in travel, political and general assignment reporting. He joined the team in January 2015 as a reporter in Bangor, moving to Portland in June of 2016. Originally from Connecticut, Dustin began his television career as a reporter for “The 9:05 News”, a weekly television newscast produced every week at his high school. He thanks Evan Foreman, the school's A/V advisor for introducing him to the career he loves, along with his wonderful family and friends for bearing with the sudden schedule changes that come with working in news. Dustin decided to pursue his passion by getting a journalism degree from Emerson College in Boston. While there, he interned for NBC Connecticut, CBS This Morning at the network's Washington bureau and WABC-TV in New York. He also filled various roles at Emerson-affiliated WEBN - TV Boston, reporting from the 2013 Presidential Inauguration in Washington, D.C. and Mitt Romney's Election Night Headquarters in South Boston and filing numerous online reports from Boston in the aftermath of the 2013 Boston Marathon Bombing and a blizzard that hit the city the same year. Immediately after graduating in late 2014, Dustin moved to Bangor to begin his reporting career filing stories from all over Northern, Eastern and Central Maine. Among the most notable were his coverage of the month-long search for convicted murderer, Robert Burton in the woods of Piscataquis County as well as a special investigative piece looking at the immigration case of Tanya Smith. Smith, then a Canadian citizen, was prohibited from returning to the U.S. after a visit across the border, when immigration officials found she had violated U.S. residency laws. Smith was stuck in New Brunswick, separated from her husband and two children in Washington County for months until Dustin's story on her aired, prompting U.S. Representative Bruce Poliquin to look at her case and help her return home to Maine. 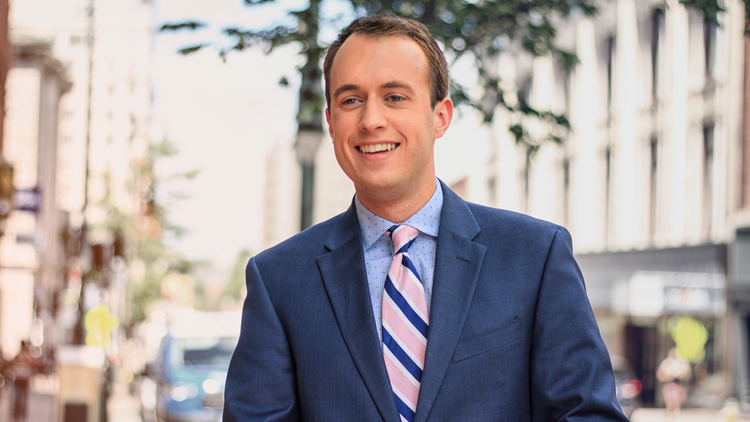 The following year in Portland, Dustin became a regular reporter for NEWS CENTER Maine's evening newscasts, often covering breaking news and politics in western, southern and central parts of the state. In 2017, Dustin added anchoring to his list of duties and can be seen regularly on Sunday’s 6p.m and 11p.m. shows. He loves hearing from viewers and helping Mainers get the information they need, so email him at dustin.wlodkowski@NEWSCENTERmaine.com or check out his Facebook here, Twitter @DWLODKOWSKI and Instagram here and shoot him a message!